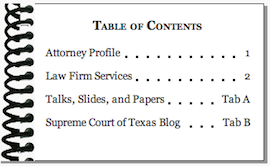 A Texas law firm focused on appeals in civil cases. Texas Supreme Court docket and voting trends. The Cert Pool, tracking petitions and amicus filings in the U.S. Supreme Court.